Star Brite Rust Eater & Converter - Biodegradable formula removes rust and oxidationBiodegradable formula removes rust and oxidation without harming original metal. Perfect as a base coat for painting metal. 22oz..
Star Brite One-Step Cleaner Wax Qt. Star Brite One-Step Cleaner Wax Qt. - All-around cleaner/wax for your boatHeavy-duty Cleaner Wax cleans, shines and protects fiberglass and metal as well as painted surfaces all in one step. Removes oxidation and chalking. Leaves a durable, protective coat..
Star Brite Power Pine Wash & Wax - Quart - Cleaner/disinfectant leaves a protective polymer film and a fresh pine scentOne quart of this highly concentrated formula makes 96 gallons. Cleans and disinfects all fiberglass, plastic, glass, metal and painted surfaces leaving a protective polymer film. Works in fresh or salt water and has a fresh pine scent. 32oz..
Star Brite Vinyl Shampoo - This concentrated, biodegradable formula removes dirt, mildew, grease and stains from all types of vinyl. Excellent for use on vinylized canvas, chairs, cushions and foul weather gear. Gets out deeply embedded grime without streaking, staining or discoloring. Simply mix concentration with water and lightly scrub vinyl for deep cleaning. 16 oz. bottle..
Star Brite Instant Hull Cleaner - Star Brite's Instant Hull Cleaner removes waterline and rust stains from all hull surfaces with no rubbing required. This simple wipe on and rinse off hull cleaning formula makes cleaning quick and easy. Star Brite Instant Hull Cleaner is much safer to use and is less aggressive to your hull than other acid based hull cleaners. Contains no strong acids or harsh chemicals. 32 oz..
Star Brite Boat Bomb Deodorizer - Quickly deodorize your boat after winter layup with cutting edge chlorine dioxide-based technology. This system produces a deep, penetrating vapor. Controls mildew odor. Package contains one 10g pouch with sponge delivery system that completely treats areas up to 1,000cu.ft. within six hours. Not for Sale in California pending registration with Cal/EPA’s DPR..
Star Brite Sea Safe Cleaner/Degreaser - Tough on dirt, grease and grime, yet gentle on the environment, this biodegradable cleaner/degreaser works great for tough cleaning and degreasing virtually anywhere on your boat. Won't remove wax or polish and is safe for fiberglass, chrome, stainless steel, glass, plastic, rubber and painted surfaces. 22oz. spray..
Star Brite Sea-Safe Hull Cleaner - Environmentally safe formula removes waterline and rust stains from all hull surfaces. Simple wipe on and rinse off formula makes cleaning your hull quick and easy. Contains no strong acids or harsh chemicals. Hull cleaner will discolor some antifouling bottom paints so take precautions to prevent contact. Much safer to use and less aggressive to your hull than acid-based bottom cleaners..
Star Brite Chrome & Stainless Steel Polish - Excellent for saltwater rod holders! This metal polish cleans and protects chrome, stainless steel, and aluminum surfaces to prevent pitting, discoloration and rusting. Easy wipe-on, buff-off application..
Star Brite NosGUARD SG Mold/Mildew Odor Control Fast Release Treatment - Safely eliminate and prevent mold/mildew odor and all other foul odor in enclosed areas with this slow-release odor control system. Ideal for long-term storage and vessel winterization, it utilizes cutting-edge NosGUARD SG chlorine dioxide technology to create a deep penetrating vapor. It begins to work immediately, lasts up to three months and can be used in occupied boats or homes for continuous odor control. Star Brite Power Cable Cleaner/Protector - Power cables "live long and prosper" with this cleaner/protector!Seals and protects cables to prevent soiling and degradation. Contains no harsh chemicals. UV sunscreen helps prevent cable drying and cracking..
Star Brite RainView - Make the raindrops disappear so you can see aheadMakes glass windshields and windows so slippery that raindrops won't stick. 8oz..
Star Brite Salt Off with PTEF - Easily rinse away salt depositsRinses away salt buildup while leaving a protective PTEF® coating to prevent future salt damage. Applicator Kit includes hose attachment/applicator and 32oz. of concentrated Salt Off. 32oz. Kit Refill is concentrated and for use with the hose attachment applicator..
Star Brite Star Cool High-Performance Synthetic Engine Coolant - Poly Organic Acid Technology (POAT) provides multi-year, extended service life and completely eliminates need for supplemental cooling additives to maintain superior cooling system performance. Protects cast iron, aluminum, steel, brass, copper and solder by passivating engine metals against corrosion and hard water scale while reducing leaks by sealing small surface fissures. Ensures maximum horsepower, performance and engine life. Propylene glycol formula is completely biodegradable and compatible with all conventional antifreezes..
Star Brite Super Eraser Sponge (2pk) - With hundreds of uses on your boat and at home, these convenient pads work great for removing scuff marks from shoes and gear and stains. Package of two..
Star Brite EZ-On EZ-Off Hull Cleaner Gallon - Strong, acid-based formula shortens prep time at haulout. Use it on fiberglass hulls to quickly remove marine deposits, scum, and rust..
Star Brite Liquid Rubbing Compound - Rubbing compounds that restore shine to faded gelcoatConvenient liquid formulas for medium or heavy oxidation. Also removes stains and scratches from fiberglass, metal and painted surfaces. Pint..
Star Brite Mildew Stain Remover - The most effective way to control and prevent mildew stains on boats, RVs, automobiles and campers, Star Brite Mildew Stain Remover instantly removes mildew from vinyl seats, cushions, tops and covers on contact. Requiring no scrubbing, this simple spray on and wipe off application works like magic..
Star Brite Sea Safe Bottom Cleaner - Formulated to remove even hardened deposits and tough stains from boat bottoms, this biodegradable cleaner works fast without harming the marine environment. Also works for cleaning baitwells, in-deck storage lockers and removing rust stains. Does not contain harsh acids or phosphates. Quart..
Star Brite Shurhold Brush to West Marine Pole Adapter - Designed to fit the handles of our Admiral- and Captain-Series Deck Brushes. All have positive-locking, pushbutton, quick-connector sockets that prevent accessories from rotating when in use..
Star Brite View Guard Visibility Enhancer 22oz. Star Brite View Guard Visibility Enhancer 22oz. - An industry first, View Guard is a wet weather visibility enhancer formulated for use on clear plastic enclosures such as EZ2CY, Strataglass and Eisenglass. Removes dirt and grit and repels moisture and salt spray for maximum visibility, even in rainy conditions. Also protects against damaging UV light that can cause clear plastic to crack and turn yellow..
Star Brite Boat Guard Speed Detailer & Protectant 220z. Star Brite Boat Guard Speed Detailer & Protectant 220z. 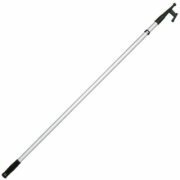 - With PTEF® polymers, this easy-to-use spray formula provides UV protection, adds shine and enhances color on fiberglass, vinyl, painted surfaces, polished metal, rubrails and more..
Star Brite Boat Hook - Extends from 4' to 8' with fast locking cam action. Made of unbreakable glass reinforced nylon..
Star Brite Fiberglass Color Restorer with PTEF - Designed to remove heavy oxidation, chalking and restore fading on colored gel coat. Unique wetting agents bring back the original color of fiberglass while special polymers seal in the finish. Combines a light duty rubbing compound for cleaning/restoring with a PTEF coating that seals the restored surface. Follow up the color restorer with a coat of Premium Marine Polish with PTEF for maximum protection. 16 oz. container.